Jain University, with a vision to empower talent through its innovative learning experience, has become an educational hub for millions of young minds hailing from more than 35 countries. Jain University enlightens each and every aspiring student on higher education and career choices. Its ever-evolving and open-minded system encourages students to exceed expectations in their area of interest, thus, guiding them to become ethically sound individuals. In an effort to continue the sporting legacy, the University is organising "My Country Run". Split into three formats - Elite 10K, Open 10K, and Cool 5K - My Country Run intends to promote future Olympians of the country and hopes to create awareness among the masses regarding the health benefits of staying fit and active. My Country Run is also an AIMS certified. Runners who have run a 10K race within the cut-off time is considered Elite Runners. Cut-off time for Men is 35 minutes and for Women is 40 minutes. 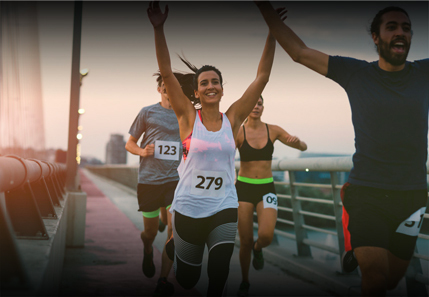 Elite 10K is a competitive category to get the best of the professional athletes. The course will challenge the athletes and provide a platform to compete against each other. Attractive prize money awaits the podium finishers. Winners are decided based on the GUN Time only. Open 10K event is for recreational runners who can enjoy the challenging 10K course in the midst of a vibrant and energetic Bengaluru crowd. Bengaluru being the running capital will attract many energetic runners to participate in the 10K. Run would attract thousands of enthusiastic runners across age groups and would be a great environment to celebrate at the finish line. Podium finishers will be awarded a handsome purse to take home. Cool 05K run is a very popular category, for many across age groups would love to participate in this favourite distance. The 05k course will provide both a challenge and entertainment for the runners. We have both a timed and non-timed options in the category. Participants in the timed category will have their timing recorded electronically and will be provided a timing certificate post run. Podium finishers in the Cool 05K timed category will be awarded cash prizes. Only the GUN Time will be considered for the winners. To create awareness on good health and wellness for every single individual in the country that, in turn, transforms into a healthy nation. To support deserving sportspersons with the best facilities and equip them to excel at National and International levels and also to create the next generation OLYMPIANS from India. To create a sports eco system / community of sports. In addition MCR launched Prayas, India's first Sports Fund for budding sportspersons across the country. We require to be fit and people underestimate the value of fitness the impact of fitness on our mental capacity. The more we train, the more we look after our bodies, the more equipped we are to sustain ourselves in our jobs whatever it may be. We can never undervalue the tool of the body that has been blessed to us, so I think fitness is something everybody requires in their own way. Swimming, jogging, training in the gym or playing a sport casually; these things definitely adds value to an individual's life. My Country Run is a great initiative by Jain University, a reminder to the people out there." "My Country Run has been initiated by Dr. Chenraj Roychand, President – Jain (Deemed-to-be University). They have been doing it for the last two years – this year’s the third. All the money collected goes to the sportspersons, supporting the defense and the police forces. They have trained many sportspersons themselves. Running is good for mental and physical health, and it’s for a great cause, so I wholeheartedly support it."